Beechcraft AT-11 V1. 1 Lite for MSFS2004 FS9 ACoF. 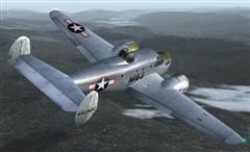 Not Recommended for flight simulator X as the VC is not a full model. Models created by Milton Shupe, panel and gauges created by Scott Thomas, textures created by Damian Radice, and Sounds created by Gary Jones. Four lite VC models and 10 sets of DXT3 textures included. Damians Paint kit is available in the library at Avsim, Flightsim, Simviation and SOH. Also look for Larry Greens flight simulator X Scenery for the Hobbs Army Airforce (HAAF) B-17 Bomber Training Base featuring AI flights, static models, and AT-11s used for new pilots, navigators, gunners, and bomber training. Beechcraft 11 V1.1 Lite MSFS2004 FS9 ACoF. Rating: 10.00 of 10 over a total of 1 reviews.